We decided that giving away a Polaris RZR was a good idea! Some lucky fella in Washington by the name of Dakota Hayes ended up winning it, so here's us surprising the guy. Tyler Roberts and Colton BrockBank ripping the Indian Scout around Godfrey Compound! Good times... Thanks to INDIAN MOTORCYCLES for the quickest street bike I've been on that's technically NOT a bullet bike... WORLDS FASTEST INDIAN. Godfrey Girls with a Lot of Horsepower! Alta Roberts, Kynlie Godfrey, Meghan Godfrey, & Kelsea Godfrey all ripping the good ol Indian's across the salt flats entrance. We showed up and the whole thing was wiped out with water! So instead of moaning about it, the girls made the best of it and decided to drag the entrance in. They were burning a good quick bit. Chaos In Caineville – Do you think you could survive? Do you think you could survive this? 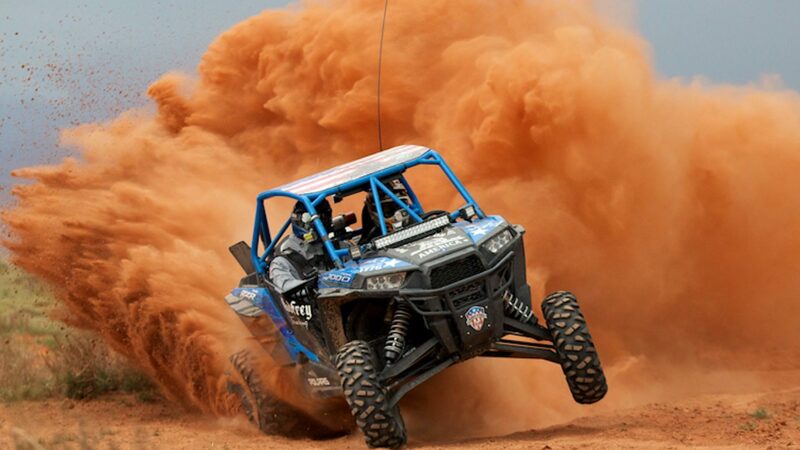 #ChaosinCainville = Polaris RZR, Bikes, Guns, Fireworks, Crashing & Lots of Fun. Have You Entered To Win Our New RZR Yet? Huge thanks to all our family who helped us not die in this adventure! Pro Armor, Husqvarna Motorcycles, HCR Racing, Edge Powersports, Moto United of Draper, Fox Racing Shox, UTVUnderground.com, Traeger Grills, MasterCraft, and our best friends from BLACK RHINO TOOLS. This is a taste of things to come... It's gonna be wicked coming Next week! Share it with the world! Felipe behind the scenes of our shoot up at Brighton resort. Gregg is the helper boy, and Tanner was the driver. Pretty Neat Right?! Check out our original video! Yepsadoozy. Big thanks to Polaris RZR, Husqvarna Motorcycles, FOX, Godfrey Clan, Timbersled, Edge Powersports, ProArmour, and all others that helped like the legendary Reagan Sieg. We crashed the DevinSuperTramp Shoot! While down at Caineville shooting for one of the funnest and most gnarly shoots the Godfrey Clan had ever done, we got the invite from DevinSuperTramp (Devin Graham, and his lovely wife Megan) to come down and hang on blobs, flyboards, and other good stuff down just an hour south of Caineville, in our other paradise LAKE POWELL. DevinSuperTramp and his crew (including Seth Jones, Creighton Baird, "Stratacous" Steven Tyler, Tyson Henderson and more) along with YouTube sensation Sawyer Hartman and his pretty lass Angelique Cooper (out of our hometown) all had an absolute party for a day down at Lake Powell, for a midweek break away from the dust! Make sure to check their video on their channel to see some of the GC hanging at their party. Pokemon Go gets Real life taser prank brought to you by the GODFREY CLAN!